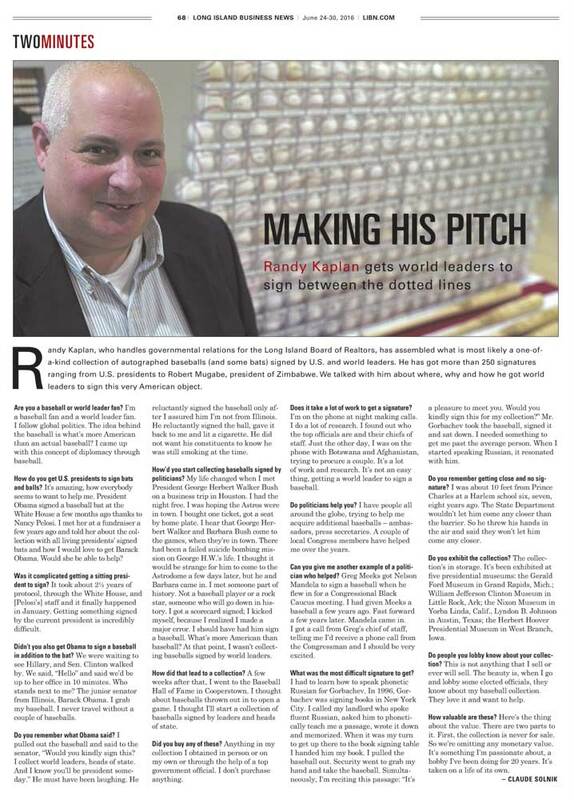 Randy Kaplan, who handles governmental relations for the Long Island Board of Realtors, has assembled what is most likely a one-of-a-kind collection of autographed baseballs (and some bats) signed by U.S. and world leaders. He has got more than 250 signatures ranging from U.S. presidents to Robert Mugabe, president of Zimbabwe. We talked with him about where, why and how he got world leaders to sign this very American object. Are you a baseball or world leader fan? I’m a baseball fan and a world leader fan. I follow global politics. The idea behind the baseball is what’s more American than an actual baseball? I came up with this concept of diplomacy through baseball. How do you get U.S. presidents to sign bats and balls? It’s amazing, how everybody seems to want to help me. President Obama signed a baseball bat at the White House a few months ago thanks to Nancy Pelosi. I met her at a fundraiser a few years ago and told her about the collection with all living presidents’ signed bats and how I would love to get Barack Obama. Would she be able to help? Was it complicated getting a sitting president to sign? It took about 2½ years of protocol, through the White House, and [Pelosi’s] staff and it finally happened in January. Getting something signed by the current president is incredibly difficult. Didn’t you also get Obama to sign a baseball in addition to the bat? We were waiting to see Hillary, and Sen. Clinton walked by. We said, “Hello” and said we’d be up to her office in 10 minutes. Who stands next to me? The junior senator from Illinois, Barack Obama. I grab my baseball. I never travel without a couple of baseballs. Do you remember what Obama said? I pulled out the baseball and said to the senator, “Would you kindly sign this? I collect world leaders, heads of state. And I know you’ll be president someday.” He must have been laughing. He reluctantly signed the baseball only after I assured him I’m not from Illinois. He reluctantly signed the ball, gave it back to me and lit a cigarette. He did not want his constituents to know he was still smoking at the time. How’d you start collecting baseballs signed by politicians? My life changed when I met President George Herbert Walker Bush on a business trip in Houston. I had the night free. I was hoping the Astros were in town. I bought one ticket, got a seat by home plate. I hear that George Herbert Walker and Barbara Bush come to the games, when they’re in town. There had been a failed suicide bombing mission on George H.W.’s life. I thought it would be strange for him to come to the Astrodome a few days later, but he and Barbara came in. I met someone part of history. Not a baseball player or a rock star, someone who will go down in history. I got a scorecard signed; I kicked myself, because I realized I made a major error. I should have had him sign a baseball. What’s more American than baseball? At that point, I wasn’t collecting baseballs signed by world leaders. How did that lead to a collection? A few weeks after that, I went to the Baseball Hall of Fame in Cooperstown. I thought about baseballs thrown out in to open a game. I thought I’ll start a collection of baseballs signed by leaders and heads of state. Did you buy any of these? Anything in my collection I obtained in person or on my own or through the help of a top government official. I don’t purchase anything. Does it take a lot of work to get a signature? I’m on the phone at night making calls. I do a lot of research. I found out who the top officials are and their chiefs of staff. Just the other day, I was on the phone with Botswana and Afghanistan, trying to procure a couple. It’s a lot of work and research. It’s not an easy thing, getting a world leader to sign a baseball. I have people all around the globe, trying to help me acquire additional baseballs – ambassadors, press secretaries. A couple of local Congress members have helped me over the years. Can you give me another example of a politician who helped? Greg Meeks got Nelson Mandela to sign a baseball when he flew in for a Congressional Black Caucus meeting. I had given Meeks a baseball a few years ago. Fast forward a few years later. Mandela came in. I got a call from Greg’s chief of staff, telling me I’d receive a phone call from the Congressman and I should be very excited. What was the most difficult signature to get? I had to learn how to speak phonetic Russian for Gorbachev. In 1996, Gorbachev was signing books in New York City. I called my landlord who spoke fluent Russian, asked him to phonetically teach me a passage, wrote it down and memorized. When it was my turn to get up there to the book signing table I handed him my book. I pulled the baseball out. Security went to grab my hand and take the baseball. Simultaneously, I’m reciting this passage: “It’s a pleasure to meet you. Would you kindly sign this for my collection?” Mr. Gorbachev took the baseball, signed it and sat down. I needed something to get me past the average person. When I started speaking Russian, it resonated with him. Do you remember getting close and no signature? I was about 10 feet from Prince Charles at a Harlem school six, seven, eight years ago. The State Department wouldn’t let him come any closer than the barrier. So he threw his hands in the air and said they won’t let him come any closer. Do you exhibit the collection? The collection’s in storage. It’s been exhibited at five presidential museums: the Gerald Ford Museum in Grand Rapids, Mich.; William Jefferson Clinton Museum in Little Rock, Ark; the Nixon Museum in Yorba Linda, Calif., Lyndon B. Johnson in Austin, Texas; the Herbert Hoover Presidential Museum in West Branch, Iowa. Do people you lobby know about your collection? This is not anything that I sell or ever will sell. The beauty is, when I go and lobby some elected officials, they know about my baseball collection. They love it and want to help. Here’s the thing about the value. There are two parts to it. First, the collection is never for sale. So we’re omitting any monetary value. It’s something I’m passionate about, a hobby I’ve been doing for 20 years. It’s taken on a life of its own.